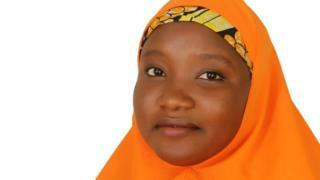 Safiyyah Jibril Abubakar wey be secondary school teacher for Zaria, Kaduna State north west Nigeria don win dis year BBC Hausa Short Story Writing Contest for Women. Di 29 year-old win wit her tori wey di title be: 'Ya Mace, or "The Girl Child" and e beat oda 25 entries wey di panel of three judges look. Safiyyah say she no believe am, wen dem tell her say she don win. "I happy well well, I no fit believe am. I get to look my phone again to make sure say no be dream I dey dream", she tok. You fit read book wey dem write for Pidgin? Her tori na of Halima wey according to family tradition, suppose marry at age 14. But by di time wey she neva marry by 17, family and friends come dey put her under pressure. Dat wan come make her settle for Garba, man wey be say she no too sabi, and afta di honeymoon, e come begin beat her and abuse her. Di marriage end for divorce, but her papa no gree accept Halima back - im beat her come ask oda family members make dem no take her in. She decide to take control of her life come rent room and begin do small small work, but di landlord come find out say she neva marry come pursue her comot. Bilkisu Yusuf Ali wey be ogbonge Hausa writer and pesin wey sabi wella, na part of di judges. She say Safiyyah tori wey win really tok about wetin dey happun to girls nowadays. "Mama and papa need to really take time to check di problems wey dey come afta dem marry dia daughters dem. Dem dey quick quick want make dem marry, but dem no dey want make dem ever come back," she tok. "From beginning to di end, na ogbonge tori be dis wey go just pin di reader come end gbam!" Two oda stories, titled Sunanmu Daya or Birds of a Feather and Zaina, wey dem name afta di main character, finish as first and second runner up. Dem go honour all di three winners for award for di last week of October. Na for 2016 dem start di competition to give Hausa female writers platform to show say dem sabi.